My husband and I love nature, we love being out in the woods, hiking, smelling the fresh scent of the trees and flowers, listening to the birds chirping and the calls of squirrels announcing our presence. 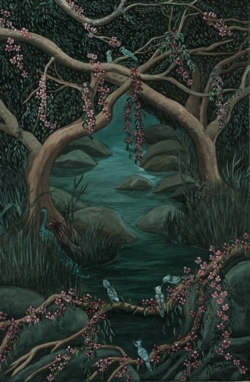 Paradise is an imaginary setting where a river flows right through the woods, the trees are intertwining, the flowers are blossoming and happy birds are singing the songs of praise. Such beauty deserves only the most appropriate title, hence “Paradise”.